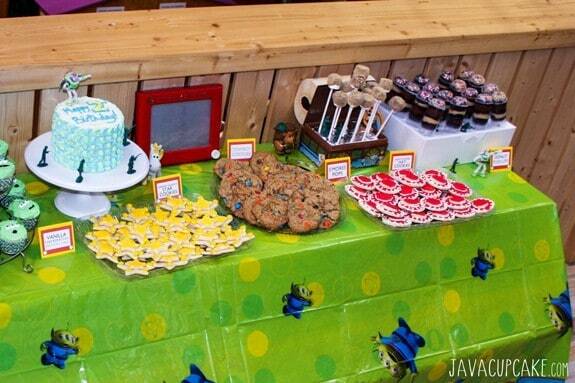 Creating a Toy Story themed birthday party doesn’t have to be difficult! Just use the recipes and techniques described in this post to create delicious, easy and crowd-pleasing Toy Story Cookies! 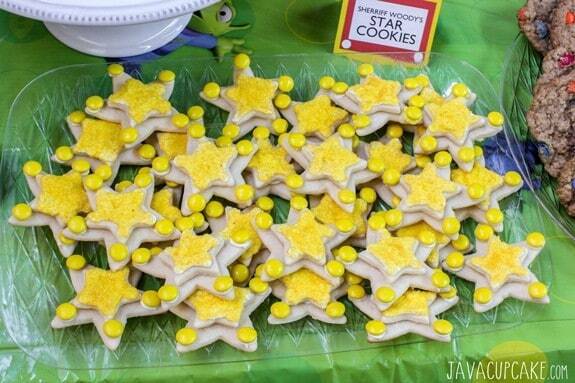 One of the most fun things I made for Matty’s Toy Story themed birthday party were the cookies. 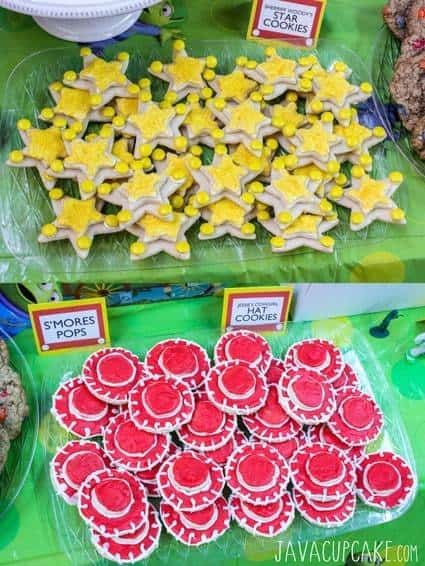 These Sheriff Woody Star cookies & Jessie’s Hat cookies really brought the theme of the party to life on the dessert table! And they were so simple to make! They did, however, take a bit of time and planning to put together. But, once I sat down to assemble them all, it was really quite easy! My daughter, Emily, who is 14 actually decorated every single one of Sheriff Woody Star cookies! If she can do it… you can too! The cookies are made from my favorite sugar cookie recipe that I’ve shared on my blog over and over again… so I’m not going to post that recipe here. But, you can find it here and here and here! 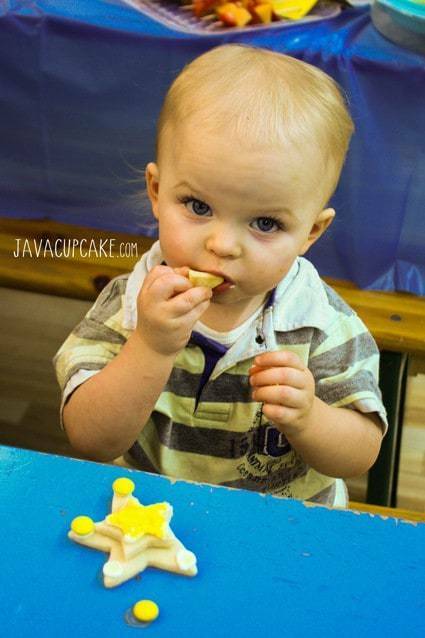 The kids at Matty’s 2nd birthday part absolutely LOVED these cookies… almost as much as they loved the cake and cupcakes! The red hats were I think they’re favorite. I think they were drawn to the bright red color. I mean, if I were a preschooler or toddler, I would be too. The Sheriff Woody’s Stars though… they were Matty’s favorite. In case you missed it… here’s the main post about the Toy Story Party. There will be three more posts coming next week that will teach you how to make the S’mores Pops and Donut Push-Ups, the Alien cupcakes and the Checkerboard cake! I’ll also be updating this post as well as the main post with all the links to these recipes and tutorials! I really hope that my ideas and creations help to inspire you to create a Toy Story themed party for your little ones. It’s really not as difficult as you may think to pull off a themed party like that that will truly WOW everyone in attendance! Prepare cookie dough as instructed in the link above. Preheat oven to 350 F degrees and line cookie sheet with parchment paper. Roll cookie dough 1/8in thick and cut out equal numbers of large/small stars and large small/circles. Place them on prepared baking sheets. Bake for 5-6 minutes and remove to cool completely on a wire rack. Prepare buttercream as instructed in the link above. Completely cover the top of one small star cookie with buttercream. Press the cookie into a bowl of the yellow sugar crystals until completely covered. Spread a small amount of frosting onto the under side of the star cookie then press onto a large star cookie. Put a small dollop of frosting onto each corner/tip of the star and press a yellow M&M onto it. Allow the frosting to dry for several hours before stacking in an air tight container until ready to eat. Prepare the piping bag with the Wilton #4 piping tip. Place 1 1/2 cups of buttercream into the bag and set aside. Using the red food gel coloring, color the remaining buttercream red. Allow the buttercream to set out for about 15 minutes so that the red color has time to soak into the frosting and really turn a dark red color. Frost the tops of the large round cookies with the red buttercream and set aside. Frost the tops of the small round cookies with buttercream. Piping a small amount of white frosting along the bottom edge of the small round cookie then gently press onto the top of the large frosting cookie, making sure it's centered. Pipe a small border around the edge of the red frosting on the large cookie and add hash marks to create the look of the stitching on Jessie's hat. Allow the frosting to set up on the cookies for several hours before stacking in an air tight container. Cookies will last up to a week if stored in an air tight container. PIN this image to share it with your friends or save it for later when you make your own Toy Story themed party! Adorable! And you have way more patience than I do. Thanks! It took me 5 days of baking to get everything done and I had teenager on dishes duty and helping with cookies too!!! The dessert table looks so cute! 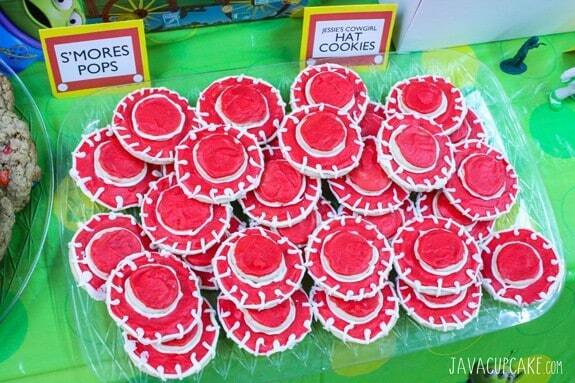 I love the cowboy hat cookies! These cookies are just too precious!